Other controls: Chord controls, ROM functions. This was my first keyboard back in the 1980’s. I learned to play a few songs (just a monophonic melody) on it. I remember playing Axel-F. I remember how cool I thought the ROM cartridge was, even though it was relatively useless. 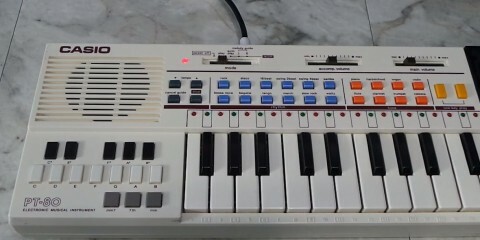 This keyboard is very similar to other casio keyboards of the time like the PT-82 and PT-87. This keyboard is really tough to use today. It has no means to transpose the keyboard, so all of the notes are treble only. It has only 8 instruments and none of them sound very good, although my favorite is the Celesta. And, of course, it is monophonic.